Frame: CAAD12 Disc, SmartForm C1 Premium Alloy, SAVE, BB30a, Di2 Ready, flat-mount disc. Fork: CAAD12 Disc, BallisTec Carbon, SAVE, 1-1/8" to 1-1/4", integrated crown race, 12x100mm thru-axle. Rims: Fulcrum Racing 700 DB, Alloy clincher, 22mm deep. Hubs: Fulcrum Racing 700 DB, 12x100 front. Spokes: Fulcrum Alloy spokes, straight pull, Bladed. Tires: Vittoria Zaffiro Pro Slick, 700 x 25c. Crank: Cannondale HollowGram Si, BB30a w/ OPI SpideRing, 52/36. Cassette: Shimano 105, 11-30, 11-speed. Front Derailleur: Shimano Ultegra 8000, braze-on. Rear Derailleur: Shimano Ultegra 8000. 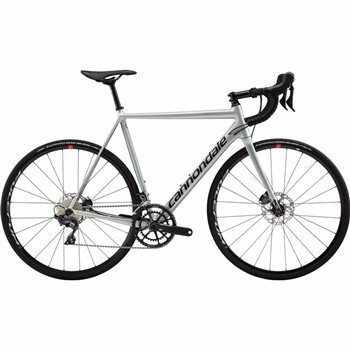 Shifters: Shimano Ultegra 8020 hydro disc, 2x11. Saddle: Prologo Nago RS STN. Seatpost: Cannondale C3, 6061 Alloy, 25.4 x 350mm (44-56), 400mm (58-63).